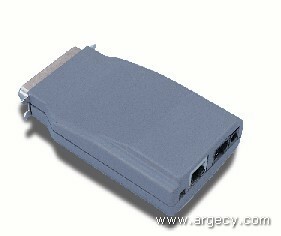 The TROYXCD Pony 100 is a compact print server that lets you share virtually any type of printer on a 10baseT/100baseTX Fast Ethernet network using any of the major network operating systems.It plugs directly into the parallel port of the printer to eliminate the need for external cabling, and it also includes a serial port.Even with its powerful features and performance, the Pony 100 is priced competitively with many Ethernet-only print servers. PPS100-8S 100baseTX/10baseT print server with 1 parallel and 1 serial port and TCP/IP, IPX/SPX, NetBEUI, NetBIOS IP, DLC/LLC, Direct Mode IP/IPX, AppleTalk protocols. PPS100-8N 100baseTX/10baseT print server with 1 parallel and 1 serial port and TCP/IP, IPX/SPX, NetBEUI, NetBIOS IP, DLC/LLC, Direct Mode IP/IPX, AppleTalk, Banyan VINES, and LAT protocols. Remote console accessible via TELNET, DEC NCP, NetWare, or WebXAdmin.